Pest description and crop damage Light yellow-green to gray-brown wedge-shaped body about 0.125 inch long. These readily crawl and jump as nymphs or jump and fly as adults. They are most important as a vector of curly top virus; they are seldom numerous enough to cause feeding injury through sap sucking. 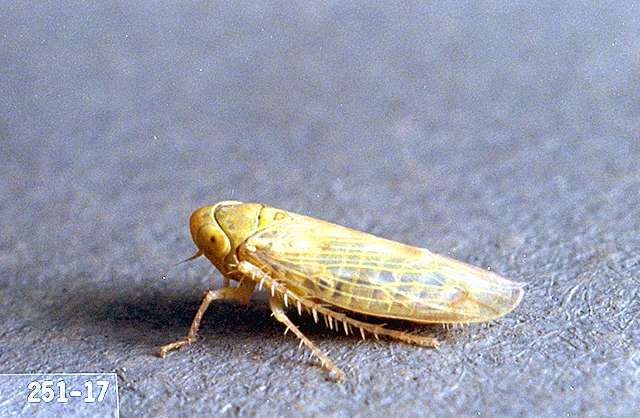 Not all leafhoppers found in sugar beets are the true beet leafhopper. Scouting and thresholds No formal economic thresholds exist for beet leafhopper insecticide treatment decisions. Manage curly top by planting approved resistant varieties rather than solely attempting to kill the highly mobile, winged adult. Beauveria bassiana (BotaniGard 22WP, BotaniGard ES, Mycotrol ESO, Mycotrol O, Mycotrol WPO - live spores of an insect-killing fungus)-See label for rates. PHI 0 days. Typically requires 7 to 10 days after first spray for signs of effectiveness. Begin treatment at first appearance of pest. Reapply as necessary. OMRI-listed for organic use. aldicarb (Temik 15G, Temik 15G Lock'n Load) at 2.1 to 3 lb ai/a. PHI 90 days, 120 days if tops are fed to livestock. Do not use tops as food for humans. Do not make more than one at-planting and two postemergence applications per crop. Do not exceed a total of 4.95 lb ai/a per season. Immediately deep-disk any spills at row ends or elsewhere to ensure the granules are covered with a layer of soil. At planting (or within 1 week prior)-Drill granules 1 to 3 inches below seed line. Granules can be placed into the seed furrow if rate does not exceed 1.05 lb ai/a. 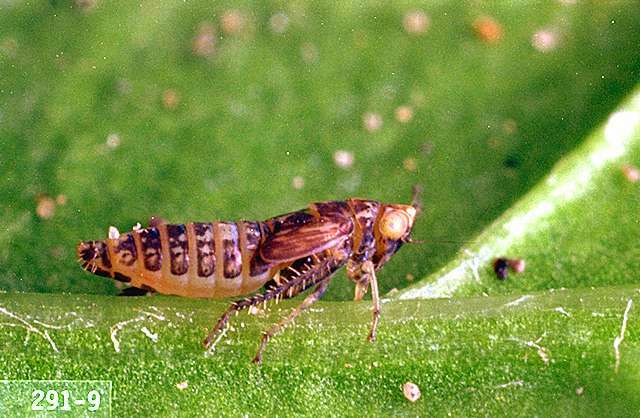 Repeat applications may be required for continued protection against leafhoppers vectoring viruses. Postemergence (multiple methods)-a) Apply granules to both sides of plant row and immediately work into the soil or cover with soil; b) For furrow irrigation, side-dress granules 4 to 8 inches to water-furrow side of plant row and at furrow depth. Irrigate soon after application. Apply within 60 days after planting. Repeat applications may be required for continued protection against leafhoppers vectoring viruses. Do not make any postemergence applications if 4.05 to 4.95 lb ai/a was applied at planting or within 1 week prior to planting. carbaryl (Carbaryl 4L, Sevin 4F, Sevin XLR Plus, Sevin 80 Solupak, and others) at 1 to 1.5 lb ai/a. PHI 28 days. For Carbaryl 4L, Sevin 4F, and Sevin XLR Plus, do not apply more than a total of 3 lb ai/a per crop. For and Sevin 80 Solupak, do not apply more than 4 lb ai/a per crop. esfenvalerate (Asana XL, S-fenvaloStar, Zyrate) at 0.03 to 0.05 lb ai/a. PHI 21 days. Apply as necessary but no more than 0.15 lb ai/a per season. mineral oil (JMS Stylet Oil and PureSpray Green)-See label for rates. PHI 0 days. Some formulations are OMRI-listed for organic use. naled (Dibrom 8 Emulsive) at 0.94 lb ai/a by air or on the ground. PHI 2 days. REI 48 hr. Do not apply more than 4.7 lb ai/a per year. neem oil (NimBioSys)-See label for rates. REI 12 hr. OMRI-listed for organic use. oxydemeton-methyl (MSR Spray Concentrate) at 0.45 to 0.6 lb ai/a. PHI 30 days. Do not apply more than once per season. Do not harvest beets or use beet tops for feed or forage within 30 days of last application. potassium salts of fatty acids (M-Pede)-See label for rates. PHI 0 days. Some formulations are OMRI-listed for organic use. sulfoxaflor (Transform WG)-at 0.047 to 0.086 lb ai/a. Do not apply more than 0.266 lb ai/a per year. PHI 7 days. terbufos (Counter CR Lock'n Load, Counter 20G Lock'n Load, Counter 20G Smartbox, Counter 15G Lock'n Load, Counter 15G Smartbox)-One application per year. Do not place granules in direct contact with the seed. Do not exceed 2 lb ai/a. PHI 110 days for at planting banded, at planting in-furrow, or postemergence applications; PHI 150 days for at planting knifed-in application. Apply at 0.6 to 1.2 oz ai/1,000 row, in 5- to 7-inch band over the row and lightly incorporate to 1 inch. Apply at 1.2 oz ai/1,000 row feet, modified in-furrow, 2 to 3 inches behind seed drop zone after some soil has covered the seed. Apply at 1.2 oz ai/1,000 row feet knifed-in. Drill granules 2 inches to the side of the seed and 2 to 4 inches below the seed.